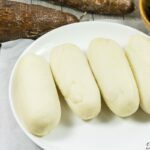 How to make pap from scratch! Pap is a corn porridge typically eaten in Cameroon and Nigeria. Instead of using whole corn as is traditionally used, I used corn flour in this recipe and the results are epic. It is authentic, slightly tangy and so comforting. I love having this for breakfast or a quick dinner. Divine! It is Monday morning in Douala, Cameroon. The air is filled with noise from the honking of the numerous vehicles ploughing the streets. Right there at the intersection of many streets sits a woman with a backyard so large that you can barely see what she’s sitting on. 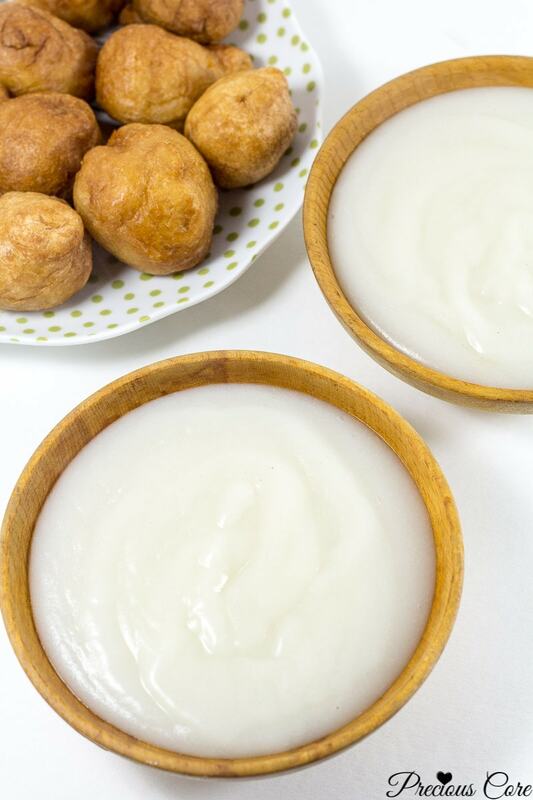 She gathers a stretchy batter from a large bowl by her hands then drops dollops of the batter into a wok with hot oil. The dollops of batter miraculously form round balls which eventually become golden brown as they dance their way through the oil. The woman, “Mami Makala” opens an old newspaper. In it, she puts in a couple of the hot balls (puff puff) then wraps them and gives to a gentleman standing beside her in a complete suit. She then opens a pot by her and scoops out a couple spoons of beans which she equally hands over to the man, whose mouth is now creating an ocean. Then she reaches for another pot, where she scoops out some corn porridge and gives to the gentleman, completing his joy. The gentleman walks out of there with his breakfast served, in exchange for a few coins. Mami Makala has a long line of customers waiting to be served. 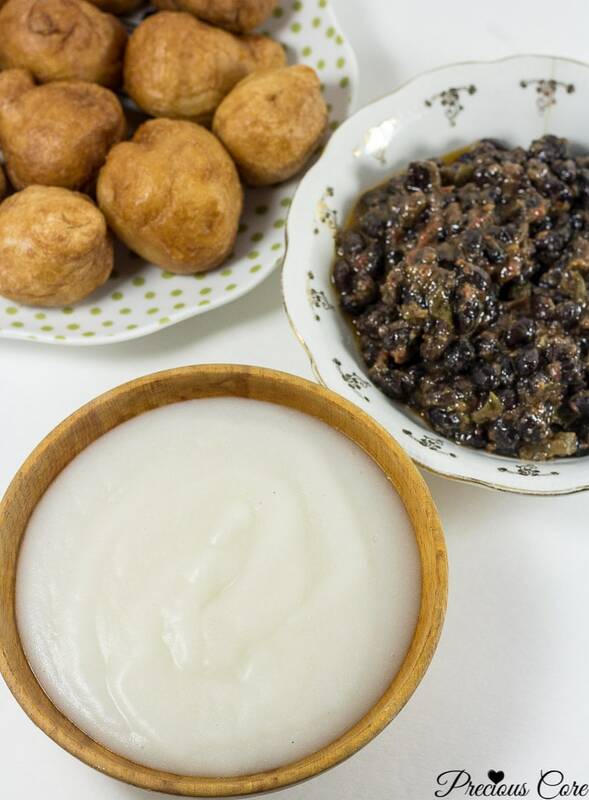 Some are there for the Puff Puff, some are there for the beans, some are there for the pap, and some are there for all three. 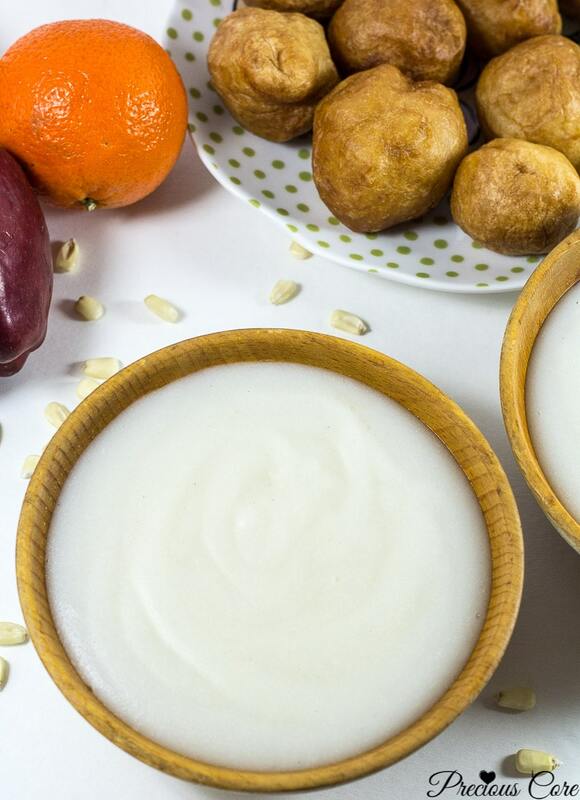 This fermented corn porridge, typically called “pap” (not that kind of pap!) is a staple in Cameroon and Nigeria. Whether eaten under Mami Makala’s shade or eaten in homes, it is hard to find a person from both countries who hasn’t tasted it. 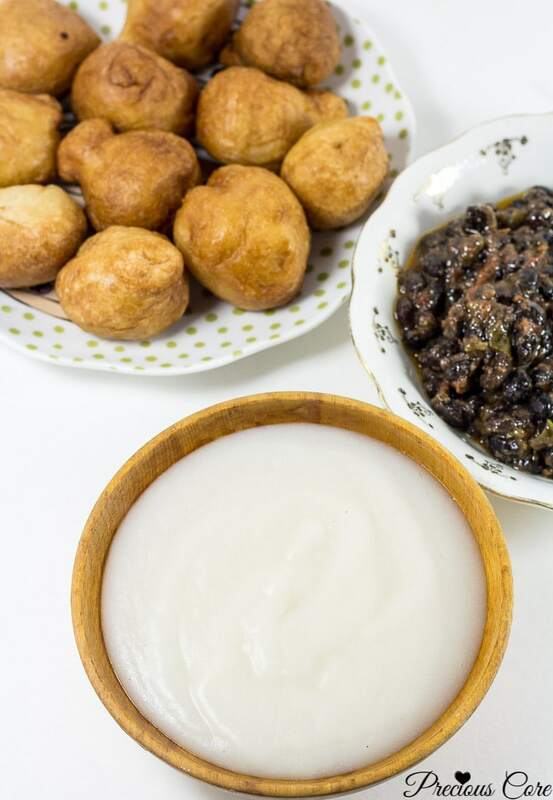 I had a fair share of eating pap also known as le bouillie (in French), akamu or ogi while growing up. Sometimes we would make it from scratch. Sometimes we would purchase the raw pre-made version then cook. On rare occasions, I purchased the pre-cooked one from a Mami Makala (or a “Mami Achombo”, depending on where you are from). During my first pregnancy, I had an unquenchable craving for pap. So whenever I attended antenatal classes at the clinic, I would stop by my favorite Mami Makala and enjoy a bowl-full before returning home. 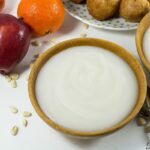 Since the whether is getting colder here these days, I thought it would be perfect to show you guys how to make this corn porridge from scratch! And that’s not all, it is wayyyyy easier than you think. Traditionally, pap is made by soaking corn (fresh or dried) for a number of days to ferment then grinding the corn and passing through a sieve to separate the chaff from the starch. HOWEVER, I completely skipped the process of grinding the corn because, wait for it… I used corn flour! 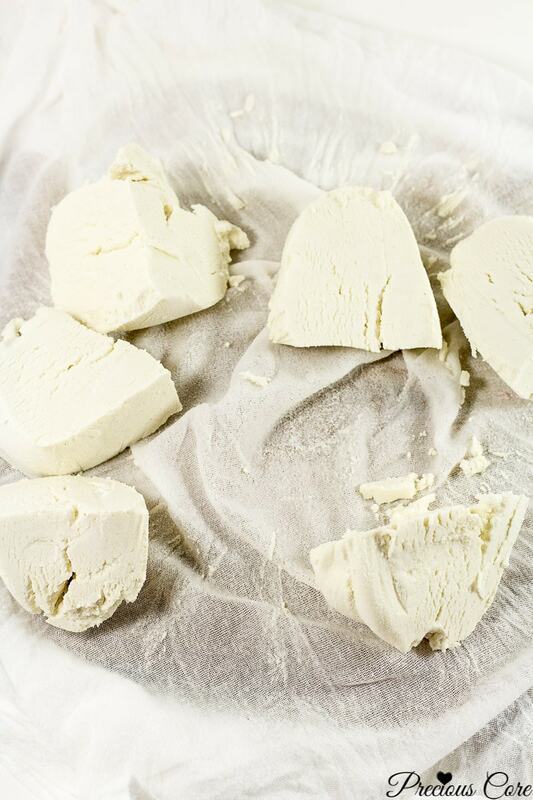 Oh my goodness – this right here is pap-making extra simplified. And the taste is so authentic that when I eat it, for a moment I could close my eyes and imagine that I am back home right in Mami Makala’s hut. So how does it taste? It is slightly tangy and just bland and delicious for the most part. I don’t even know how bland and delicious found themselves in the same sentence but trust me when I say it is GOOD. All you need to do is soak some corn flour covered for about 3 days in a warm place. Then pass it through a fine mesh sieve to separate the starch from the chaff. Then you cook some of the starch in boiling water. The result is pure epicness in a bowl, the comfort food you and I need in this season. This is what breakfast dreams are made of – totally! I also love making it as an easy dinner for my kiddos. We love it! I made a video to show you guys the complete process because I love you. Watch me make some pap from start to finish then go make yours and weep for joy! 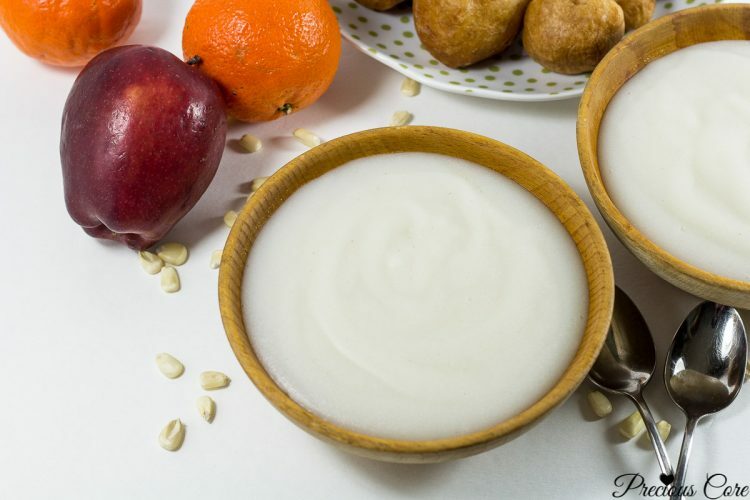 How to make pap, a corn porridge typically eaten in Cameroon and Nigeria. Instead of using whole corn as is traditionally used, I use corn flour in this recipe and the results are epic. It is authentic, slightly tangy and so comforting. I love having this for breakfast or a quick dinner. Divine! Place corn flour in a large container with a tight-fitting lid (preferably a plastic container because plastic retains heat). Add water to come up above the corn flour. Mix well with a wooden spoon or whisk to dissolve any lumps. Cover and place in a warm area to ferment for 3 days. After that, it will have a pungent smell - this is perfectly okay. It might also have bubbles at the top - this again is okay. Pour out the water from the top of the corn paste. 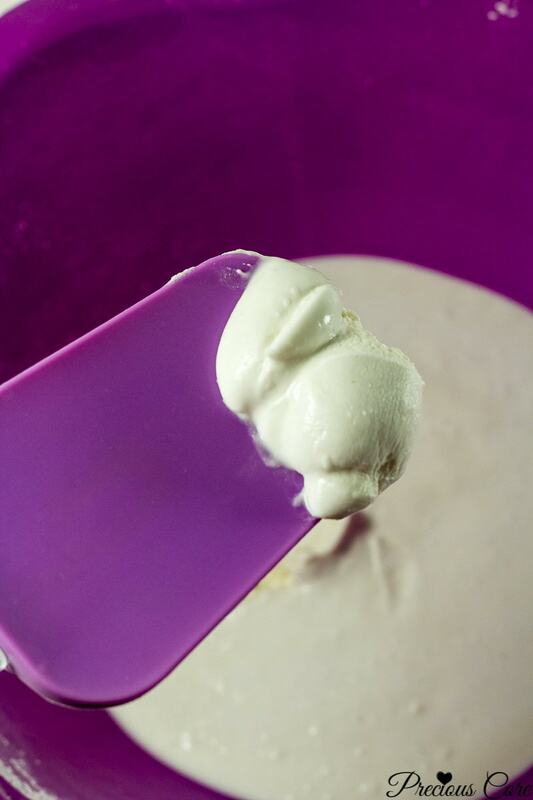 Then add fresh water into the fermented corn paste and whisk well to form a light creamy mixture (about the consistency of whole liquid milk). Place a fine mesh sieve above a large bowl. Then pass the liquid through a fine mesh sieve to separate the chaff from the starch. You may need to do this in small batches depending on how large your sieve is. Place the chaff in a separate bowl. When all the chaff is separated from the starch, add more water into the chaff and mix to form a light creamy mixture (about the consistency of whole liquid milk). Pass it again through the sieve and press chaff with a spoon (while on the sieve) to squeeze out the excess liquid. Repeat the process as needed until the chaff is no longer creamy. Let the corn starch rest for 1-2 hours. During this period, the water will come up and the starch will stay at the bottom. Pour out the excess water at the top. 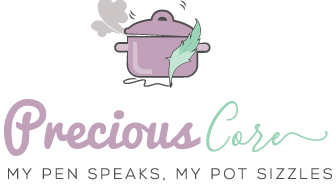 You can proceed to cook the corn starch right away or preserve. 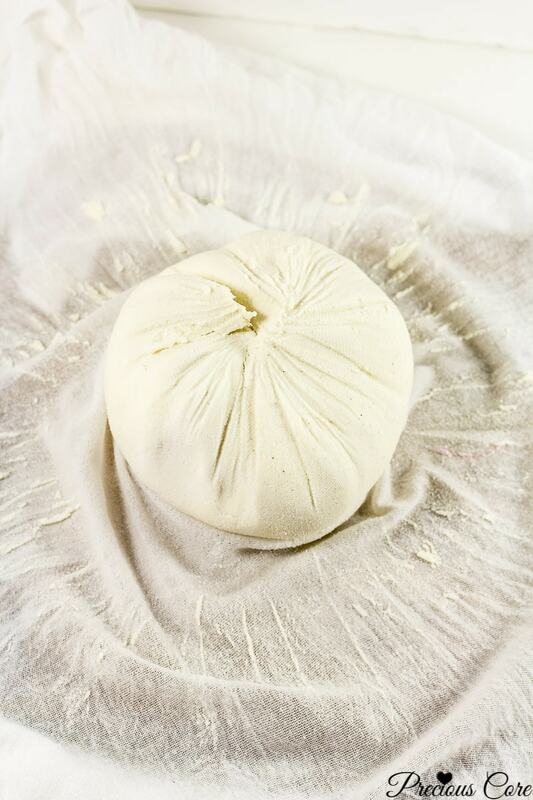 To preserve: place the corn paste into a plain (preferably white) kitchen towel or cheese cloth. Then squeeze well to remove excess water. The corn starch will now be hard. 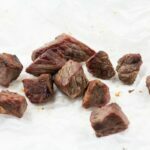 Cut into desired sizes then put in ziploc bags and place in the fridge or freezer for future use. Mix 1 cup and a half of fermented corn paste (the soft version, not squeezed yet) with a quarter cup of water. Please watch the video to understand what I mean. Note: If you are using the hard version - use half a cup, mixed with half a cup of cold water to form the corn paste. Bring four cups of water to a boil. Then add the corn paste mixture to the boiling water, stirring rapidly with a wooden spoon as you do so. The mixture will thicken rapidly. Let it cook for 2-3 minutes while you stir continuously. If you love it lighter, you could add more water at this point. Sweeten with sugar to taste (I used about half a cup) then tun off the heat. 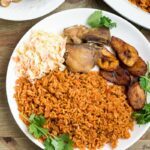 Serve hot as it it with some evaporated milk poured ontop or with akara/accra beans or puff puff. Alternately, you could cook your pap by add the boiling water to the corn paste mixture in a bowl, away from the heat. If you choose to use this method, you must equally stir simultaneously as you pour in the water to prevent lumps from forming. 1. Traditionally, pap is made by fermenting whole corn then grinding the corn and passing through a sieve. If you choose to follow this method, note that you will need a powerful blender to grind the corn. 2. Flavor the cooked pap with some fresh lemon juice or lime juice if you like. 3. You need a fine mesh sieve for this recipe. This is different from a regular strainer. You could purchase it online from Amazon here (affiliate link). AN EVEN BETTER OFFER FROM OUR FRIENDS AT POST CEREALS! Ogi is a very good breakfast where I’m from. I also love taking it with akara. 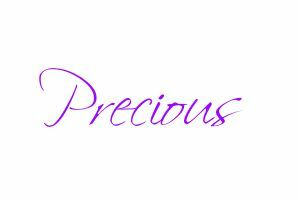 Precious, thank you for bringing the memories. 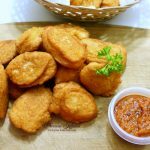 It is so good with akara! Glad to awaken memories for you, dear. Where do we get that cornflour? I live in Massachusetts and what we have is corn meal. Please give me the name of the brand shown in the video. Can’t wait!! Hi Yvonne, you can get the flour from the African isle in an Asian store. That’s where I got mine. The brand is called, “Asli”. I’m sure corn meal will work too but I just haven’t tried it yet. Thank you for the info Precious. I will check it out the next time I go to the store so I can experience some of that yumminess from home! You are most welcome, dear. To make corn flour all you need to do is grind dried corn into a powder. You might need a large grinding mill to do that.